Australia’s return to offshore detention and processing centres for asylum seekers signals a renewed willingness to renege on its responsibilities to vulnerable others. Removing asylum seekers from national territory also removes the possibility of an ethical response to their plight. 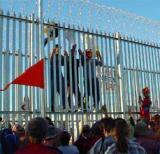 Protesters at the WoomeraDetention Centre in 2002.Photo: RedUnderTheBed,Free Art Licence.As Matt Gibney has described, until John Howard’s Liberal government came to power in 1996, Australia had often exceeded its international obligations to refugees and considered tackling the problem of forced migration as a key way to demonstrate that it was taking its international responsibilities seriously. Over the last twenty or so years, however, Australia’s has become one of the most punitive asylum systems in the developed world. Governmental efforts to evade its obligations to the international refugee regime reached crisis point in 2001 when a Norwegian freighter MV Tampa, which had picked up 438 ship-wrecked Afghan refugees attempting to reach Australia by boat, was denied entry to Australian waters. The country’s wide-ranging practices of detention have also come under international scrutiny. Woomera detention centre in South Australia, which closed in 2003, provoked an outcry among the Australian public after the extent of its mistreatment of detainees was revealed. Revisiting a debate which seems rarely to be off the agenda in contemporary Australia, the recently published expert report does attempt to take a more holistic view of forced migration in the region by recommending increased cooperation with Indonesia and Malaysia to improve protection for asylum seekers in these countries, the expansion of Australia’s Humanitarian Program and greater engagement with refugee-producing countries. Unfortunately, this welcome emphasis on dialogue and collaboration is outweighed by a number of recommendations which lower the standards of the country’s refugee protection regime and undermine Australia’s authority as an advocate of human rights. These include turning back boats carrying asylum seekers towards Australia and amendments to the country’s 1958 Migration Act to allow for all asylum seekers to be taken to regional processing centres offshore, regardless of whether they arrive in excised territory or the mainland. This latter recommendation, which has now been enshrined in Australian law, includes ‘the removal of provisions stipulating the minimum conditions which must be met if a country is to be designated for offshore processing’. As the Refugee Council points out in its response to the panel’s document, this means there are now no guarantees that those asylum seekers taken to offshore locations will be treated according to international law on refugee protection. One of the report’s most controversial recommendations is the reopening of offshore detention and processing centres in Nauru and Papua New Guinea. Reprising John Howard’s ‘Pacific Solution’, which Gillard vociferously condemned on a ‘matter of principle’ in opposition, the return to these measures signals a renewed willingness to outsource responsibilities for refugees and to renege on international obligations to protect their human rights. Headed up by a former defence chief, Angus Houston, the panel and its recommendations testify to the ongoing political entanglement of asylum issues and national security. In this case, national defences must be shored up by shipping the perceived threat offshore. Of course, this practice of ‘outsourcing’ is not exclusive to Australia. The shift in focus among refugee-receiving countries in Europe from post-entry controls – such as in-country detention and dispersal – to concerted efforts to prevent entry has led to surprising amounts of cooperation from nations often at odds on other issues; what Daniéle Joly has called ‘harmonised restrictionism’. In a newspaper article for The Times in 2001 Tony Blair called for a renegotiation of the 1951 Refugee Convention to allow for asylum claims to be processed outside the European Union in what Gibney describes as ‘warehousing countries’. Similarly, a controversial ‘Friendship Treaty’ brokered between Italy and Libya in 2009 allowed for the removal to Libya of asylum seekers arriving in Italy in exchange for infrastructure investment which, one imagines, would cover the cost of building detention centres on Libya’s coast. These outsourcing measures have resulted in the proliferation of both makeshift and institutionally-sanctioned camps at sites on the borders of Europe where the flow of people is greatest: Lampedusa, Malta and Sicily to name but a few. Offshore processing and detention centres allow signatory nations to defer, delegate and devolve their responsibilities to international refugee protection regimes and so raise a number of pressing material concerns about the need to guarantee the rights of asylum seekers. Conceptually speaking, however, the notion of being ‘offshore’ also describes the challenging condition of statelessness in times which, despite the often-anticipated demise of the nation-state, remain determined by conceptions of national sovereignty. Although in practice ‘offshore’ often corresponds to an identifiable location – Libya, Papua New Guinea – it is also a conceptual ‘elsewhere’ which allows governments to conceal their responsibilities to those seeking refuge. Globalising forces have rendered the relationships between refugee-producing countries and those receiving them both more visible and more complex. What offshoring practices demonstrate, however, are the ways in which refugee-receiving countries are ever keener to reverse this trend by hiding their interactions with those claiming refuge. The non-place of ‘offshore’ not only exacerbates the negative effects of statelessness in a world which remains primarily organised around sovereign nations, but also removes the possibility of a confrontation between an ostensibly nationally and socially cohesive body and an outsider who asks for refuge. For philosopher Emanuel Levinas, it is precisely in being confronted with ‘the fact of the other’ that our ethical responsibilities become clear. Only in coming face to face with what Levinas calls ‘the widow, the orphan, the stranger’, can we understand the extent of our ethical responsibility to others as well as the enormous challenges posed by the possibility of living up to it. Whether we respond to this confrontation generously or, in Simon Critchley’s words, we ‘pass them by on the street, silently wishing they were somehow invisible and wincing internally at [our] callousness’, the interaction nonetheless provides the opportunity for ethical action and self-questioning. This is precisely the reason why offshoring is so troubling: because in removing the possibility of an encounter between citizens and asylum seekers, we also remove the possibility of ethical action on their behalf. This process is being replicated on a global scale. Despite the consensus among liberal democracies that the responsibility to vulnerable others is one that should be borne, governments persist in legislating against a confrontation with this ethical challenge by detaining and socially segregating asylum seekers. It seems that by contriving scenarios which ensure the invisibility of vulnerable others, nation-states absolve themselves of the obligation to safeguard their basic rights. Offshore locations not only suspend asylum seekers in a state of transience, precariousness and semi-legality, but they also remove ethics and responsibility from the realm of everyday lived experience.